I’m just going to start by saying that this review would have probably been different if I wasn’t Italian myself. I do feel slightly bad for WOLF — The Italian Street Food, for they have been, in a way, unlucky. I, unfortunately, have to admit, in fact, that this place had only a small hint of Italian food. 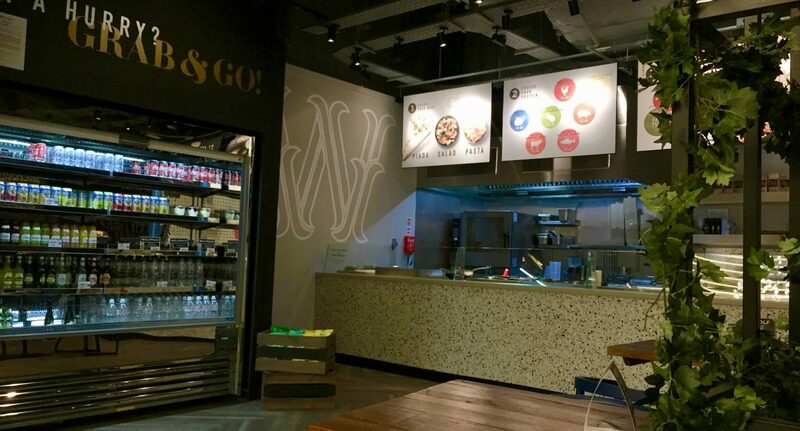 This street food vendor has recently opened in the Arndale centre’s new food court on the ground floor. The interior design is enjoyable. A fake leaf motif runs all around the space, which catches your attention. The waitress at the counter tells me I can choose between three main dishes that I can fill with different toppings and sauces later. The choice is between a piada (an Italian flatbread she refers to as Italian burrito), a pasta dish (either penne or spaghetti), or a salad. I go for a piada and a box with penne. The piada is put on a grill for 30 seconds, and the penne is already cooked. I try to fill these dishes with anything even remotely Italian or traditional. However, the meats you can choose from are either spicy chicken or lemon chicken which don’t ever go in pasta or piada. Otherwise, there are the deli meats which are prosciutto, spicy salami, ham, and again, chicken. Salmon and grilled vegetables which looked good make up another choice. I eventually went for a piada with prosciutto, ham, artichokes, tomato, and spinach inside as they were the only ingredients that could possibly go well with it. Following this was pasta with salmon, tomatoes, artichokes and rocket. I myself would not really associate rocket with salmon but had no better choice. And then the sauces: pomodoro sauce, pesto, red pesto, Alfredo sauce, and so on. None of them should go with the piada but out of desperation I just put pesto in both. Lastly, I get asked if I want any kind of cheese but the choices are only feta (GREEK FOOD) or parmesan. With preparation done, the waitress puts the food on my tray. The food itself was alright, but the penne tasted cold and over-cooked. The piada felt cold too and was gummy, not crispy as it should be. The overall taste was pleasant, though some combinations of flavours weren’t the best. Although they were my choices, it was all due to the lack of real Italian ingredients. However, the salmon and the artichokes were very tasty. If WOLF had been a normal street food vendor I would have not been surprised by the food selection as it followed British cuisine and local taste quite closely. But since it was stressed everywhere from the name to the menu, to the signs on the wall and to the website, that it was GENUINE ITALIAN then yes, I was expecting closer attention to the Italian food tradition. I was not expecting simply a few ingredients thrown on a tray. Quick and easy street food — but not authentic Italian as promised. 5/10.